Podcasting is growing by leaps and bounds these days: the number of podcasts, the number of podcast downloads by the public, the general awareness of podcasts, and the number of people listening – these are all way up over the past ten years. Podcasting can be a very effective way to expand your business, to build your personal brand, and to spread the word about the various things you do. It can also be a labor of love: you produce a podcast simply because you’re passionate about the subject matter, and you enjoy producing talking and spreading the word about it. Contrary to popular belief, podcasting doesn’t have to be just a labor of love. You can in fact monetize a successful podcast, and in this guide I’m going to give you a basic overview of how to start a podcast, and then give you some ideas about how you might earn money from it. What do I know about it? Well, I host one podcast and co-host another, and combined I’ve produced close to 1500 podcast episodes. My primary podcast reached as high as #2 in News and Politics on iTunes. So I have some experience. Now let me be honest with you: there’s a lot you need to do to get a podcast up and running. But most of what I’m about to explain to you needs to be done only once, and then you never have to think about it again. So don’t be discouraged! Podcasting wouldn’t be growing by leaps and bounds if it were extremely difficult, or if you had to be a computer specialist to do it. Step One: What’s Your Niche? Only you can answer this. Decide what the subject matter of your podcast will be. Don’t assume that because podcasts covering your preferred topic already exist, you can’t successfully start your own. There’s a huge and growing podcast audience out there, and you can grab your share of it if you produce good content. You also need to decide how often you want to release episodes. Whatever decision you make, stick to it. Be consistent. Build a reputation as a reliable producer of content. I myself host two podcasts, one that releases a new episode every weekday – that’s quite a commitment that I don’t recommend you take on lightly – and another that releases a new episode once a week. It’s up to you. I have two microphones. One is an Electro-Voice RE-20. Amazon price: $449. The second is the Audio-Technica ATR-2100. Amazon price: $79. And you know which one I use? The $79 Audio-Technica. I just think it sounds better. The audio quality of my podcast is top notch thanks to this microphone. I strongly recommend it to you. Also, because it’s a USB microphone, it will plug directly into your computer without any need for a separate mixer unit. If you’re not prepared to shell out $79 for a microphone, I prefer not to recommend a cheaper one to fit your budget. If we were talking about anything other than a microphone for a podcast, I’d find some way to help you shave off a few dollars. Instead, I’ll urge you to simply save up for the Audio-Technica. Sound quality is an essential ingredient in a podcast. If your sound quality is substandard, you will get fewer subscribers. That’s a fact. In the past, I would have had to list about seven more steps: get a media host, get web hosting, website support, and more. Awful. It’s what I had to do. If I had it to do over again, I would without a doubt use Podcast Websites, a brand new all-in-one solution for podcasters. I don’t earn anything promoting them to you. I am promoting them because this service will save you so much time and make your life, and your podcast launch, immeasurably easier. Podcast Websites will get an attractive, podcast-friendly website set up for you, give you a place to store your episodes (you do not store them locally, on your own site), provide support (as a podcaster myself, I’ve had to run around from freelancer to freelancer to find people who can do this or that little fix for me), and more. Do not even consider not taking this option. I don’t do it myself because I started out before Podcast Websites existed. But what a tremendous burden off new podcasters! For recording a guest, I use Skype. I haven’t found anything that beats it in terms of sound quality. There are convoluted ways to set up your equipment, including buying an expensive mixer, whereby you can record Skype calls directly into your system without the intermediary of a special software program. I prefer the much easier route of using a program like Pamela to record Skype calls for me. If it’s impossible to get a particular guest to use Skype, I do the next-best thing: I ask for a landline phone number, and I dial it via Skype. So on my end, it’s always Skype. You’ll want an intro and an outro recorded for your podcast. A lot of people recommend Music Radio Creative. I’ve never been happy with anything they’ve produced for me; it’s like they have a tin ear or something. I’ve been far more satisfied with Audiobag. I’ve also used and been happy with Tim Paige, who does the intros for big podcast names like James Altucher and John Lee Dumas. Now that I podcast with a Mac, I use eCamm Call Recorder. You’ll need a graphic for your podcast. This will appear on people’s mobile devices when your show comes up. It will also appear on iTunes, Stitcher, and other podcatchers when people look up your show. You can get a very inexpensive one through Fiverr. I used an in-house designer for one of my podcast graphics, and for the other one I used Studio 1 Design. You can take 10% off your order if you use this link: http://www.Studio1Design.com/woods. John Lee Dumas recommends having three episodes ready the day your podcast launches, and I agree. Naturally, three episodes means more downloads of your show, which in turn can help propel you into the coveted New and Noteworthy section of iTunes, where successful new podcasts can spend up to their first eight weeks. Being featured in New and Noteworthy can generate some nice organic traffic for you, so you should definitely shoot for it. Also, having three episodes makes clear that you’re not a one-hit wonder, like many abandoned podcasts. And having more than one podcast gives the listener the sense that this is a show to subscribe to. When there’s just one episode, people may click PLAY and never come back. Now it’s time to promote and grow your podcast. John Lee Dumas has some excellent strategies for doing that in his free Podcast Workshop webinar, which I strongly urge you to attend. Of course, spreading the word to your friends, learning how to maximize the potential of social media, and making an effort to appear as a guest on related podcasts are all good ideas. But don’t forget what your guests can do for you, too: ask them to share their appearances on your show with their networks. That way, you can leverage your guests’ audiences, and maybe get some new subscribers along the way. If your podcast begins to attract a substantial audience – and you’ll see download statistics inside Libsyn, Podcast Websites, or whatever platform you choose – you can start thinking about sponsorships. This is an excellent way to monetize a podcast, though it can be a challenge. The most common way to get sponsorships is to approach sponsors yourself. You should have all your statistics on a basic rate card or an attractive infographic. The sponsor should be told about your show, your audience demographic (Libsyn has a way you can poll your audience to find out this information), what your advertising package consists of (how many advertisements per episode, and how long each one is), and what your rates are. In my case, I require sponsors to sign up for a month’s worth of advertising. Anything less than that and they won’t see adequate results. I do 20 episodes per month, and since I want to spread out a sponsor’s ads for maximum effect, my sponsorship package consists of advertisements on seven episodes, spread over a month. The total charge for that episode would be $198 + $275 = $473. To say the least, not everyone is able to command the rates John Lee Dumas can get. His podcast is in an excellent niche: entrepreneurship. He has an audience of 30,000 small businessmen listening to every episode. There are countless companies that would love to get their products in front of that ideal demographic. So your rates may be lower, perhaps considerably so. Getting podcast sponsorships is a difficult slog, though. If you can get an agency to represent you to potential sponsors, you’re going to have much more success. One service that will book ads for you is Midroll.com – that is, if they accept you. You need somewhere in the neighborhood of 7000 downloads per episode of a daily podcast, at minimum, for them to consider you. And even then, they’re fussy about the subject matter of your podcast. (I was told they don’t like political podcasts, but they have Best of the Left, and their acquisitions person posts pro-Bernie stuff on Twitter, so make up your own mind.) But if you can get accepted by Midroll, you’re in excellent shape. If you have a tech-related podcast, you can inquire with Archer Avenue, which specializes in such shows. Even better than Midroll, since anyone can join, is Advertisecast. On Advertisecast, you can list your podcast and its advertisement availability – say, two 15-second ads at the beginning of the podcast and two 60-second ads somewhere in the middle – as well as your listenership numbers and the rate you’re charging advertisers. Then advertisers can come directly to you, without a middleman. 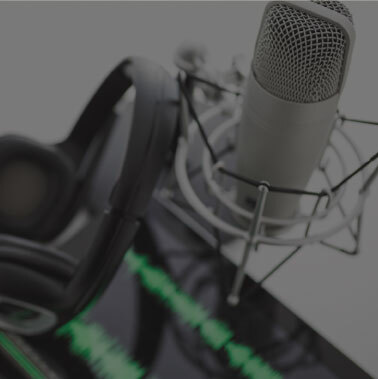 Podcast sponsorships are likely to grow in the coming years, what with the dramatic expansion in podcasting and podcast audiences, as well as the sheer effectiveness of podcast advertising. A host the audience trusts reads or ad libs the ad, often inserting his own personal stories related to the product. This has had much better results for advertisers than more traditional outlets. If you have difficulty getting sponsorships, or if you can’t get them for all your episodes, you can also monetize your podcast through affiliate programs. Affiliate marketing involves earning commissions for selling other people’s products. You are given a special link so the company can track where sales are coming from and give you appropriate credit for your sales as an affiliate. 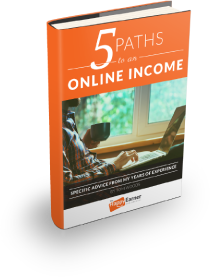 We have a comprehensive Affiliate Guide here at The Happy Earner, so I recommend looking at that to understand affiliate marketing better. On this page I just want to show you how affiliate marketing and podcasting can work in tandem with each other. As you probably know, affiliate links are long and generally filled with a string of unrelated characters. There’s no way to read a link like that during your podcast, and no one would write it down if you did. That’s one reason it’s helpful to get a plugin called Pretty Link. Honestly, I don’t know what I’d do without it. The idea is simple: in place of a long, clumsy affiliate link, you can create a short, easy-to-remember link that redirects to your affiliate link after someone types it in. For example, I am an affiliate for Bluehost, a web hosting company. My affiliate link is http://www.bluehost.com/track/tewj57/. No way am I saying that during my show. And that’s one of the shorter affiliate links I’ve seen! Pretty Link lets me change that link to the much easier www.happyearner.com/blue. I have given out that link on my show many times, and I’ve had many people get web hosting through Bluehost as a result. If you’re looking for products to promote as an affiliate, here’s how to do it. First, think of products and services that your particular audience would find useful. Then, visit the website of that good or service and look for a link to “Affiliates,” usually toward the bottom of the home page. If you don’t see it, then Google the product name along with the word “affiliates.” Some companies don’t run their affiliate program in house, and instead outsource it to companies that specialize in Internet marketing, so you’ll need to go to that company to sign up for that product’s affiliate program. Another way to go about it is to create an account at places like ShareASale, Clickbank, CJ Affiliate, or FlexOffers (there are others, but these are the ones I’ve used myself), and just browse through the many affiliate programs they have, across a wide variety of genres. I also promote a homeschool curriculum I helped design courses for. Again, it’s a curriculum in which my listeners would have a special interest. And I’ve set up a special page on which people get $140 in free bonuses if they join – and the join button contains my affiliate link. High-ticket items do much better when pitched via webinars than when pitched via a plain old sales page. If you have such an item, you should create a webinar for it and invite your podcast listeners to attend. One of these days I’ll write up a guide to holding a successful webinar. This strategy is likely to yield dividends only once you’ve built up a substantial audience, and of course it helps to have built up a whole bunch of bonuses you can give away as well. I’m fortunate in that regard: I’ve written a dozen books over the years and I’ve created an enormous amount of premium online content, particularly in the form of courses, both for homeschoolers and for adult enrichment. That’s how I was able to set up a Supporting Listeners program for my podcast. I don’t know of any donation program that gives away so much content to people who donate. If you don’t have anything to give away, this strategy may not work for you just yet. On the other hand, one feature my supporters have enjoyed very much is a private Facebook group, set up just for them. There they can talk to each other and directly to me about the show, guest suggestions, topics we find of interest, or whatever. Just making that simple and free resource available, but limiting it to people who make a financial contribution to the show, helped increase the number of my supporters and made them happy. Everyone enjoys the camaraderie, as well as the chance to have discussions with the host of a show they enjoy. I’m a member of Podcasters’ Paradise, the comprehensive podcasting site created by the extremely successful podcaster John Lee Dumas. Just how successful is John? He grosses about $200,000 per month from podcasting. I recommend listening to my podcast episode with him. I guarantee you will learn a great deal of valuable information by attending John’s free webinar, at the very least, or, if you have more time, taking his free podcast course. Even if you don’t envision your podcast primarily as an income source, John’s premium site Podcasters’ Paradise is a real asset to have. He takes you step by step through the technological side – what you need to buy, how to set it up, what audio editing software to use, how to use it, and so much more. He shows you numerous strategies for growing the audience for your podcast. (That’s crucial: so many podcasts are lucky to get between 100 and 200 downloads per episode.) And he shows you example after example of how you can monetize your podcast. I learned the most from this section in particular: John taught me strategies I’d never thought of before, and they have paid off very well. I have a pretty big audience, so if you decide to join Podcasters’ Paradise, join through my affiliate link and I’ll be glad to appear on your podcast as a guest. I’ll promote the episode to my audience and give your podcast a boost! Whatever you decide to do, a podcast can take your message, and your business, to a whole new audience. My only regret is that I didn’t start sooner. The amount of work involved seemed too great, and podcasting seemed too difficult to master. Neither fear was true. In podcasting, as in business at large, inertia is your enemy. If you’ve decided to podcast, congratulations! Get started now.